Chrichton's World: Review Passenger 57 (1992): Very flawed but one of the better Die Hard Clones! 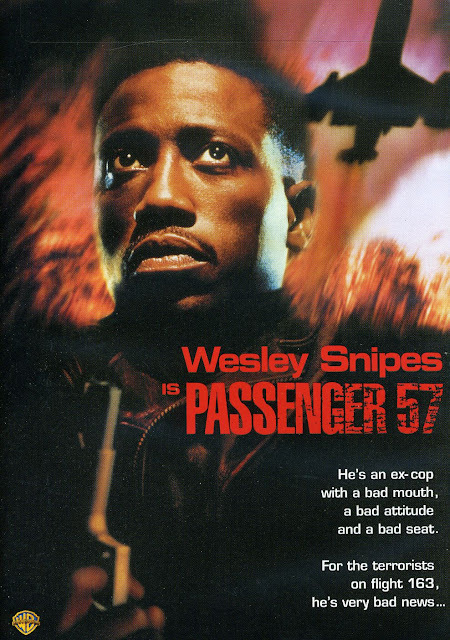 Review Passenger 57 (1992): Very flawed but one of the better Die Hard Clones! Snipes as the unwanted hero and Bruce Payne as the villain do an excellent job of making this Die Hard on a plane worth your while. You will have to excuse the film for some uneven pacing and flawed scripting. Other than that the action is quite good and there is more than enough eye candy to keep you entertained. Passenger 57 for the most part is one of those action flicks that you should not take seriously at all. Because if you do you will only notice flaws. From the way Wesley Snipes plays it you can tell that that you should take events lightly. There are several occasions where racial jokes are made and it does add to the despair of the main character John Cutter who is trying his best to save people. Instead he gets seen as one of the villains and even worse is called boy. Then there is the one where he gets mistaken for Arsenio Hall. Nowadays people will wonder who that is but back then he was huge talk show host so it made more sense then. Even if you don't get the pop culture reference the way Snipes responds to this is quite funny. And at the same time gives him an excuse to be gone from the scene and to be overlooked when the hijack starts. It is Snipes approach to things that makes it rewarding. I think this was one of the first movies where he had the lead in a big blockbuster action film and had no idea he was a skilled martial artist. He pulls of some moves like it is nothing and is a real joy to watch. Then you have Bruce Payne as Charles Rane who simply is delightful as the main villain. He also doesn't take his role too seriously and yet manages to make Rane disgusting and creepy enough for the viewer to dislike him. Passenger 57 is not without some suspense and thrills but compared to Die Hard of course this does not come close. However compared to the other Die Hard Clones this definitely is a good one. Even today it's never boring. Maybe it is lacking in some spectacle but like I said that is more than enough compensated with the way Snipes and Payne play their roles and eye candy in the form of Alex Datcher and Elizabeth Hurley. I do remember being quite take with her the first time I saw this film on video. And now that has not changed at all. She still is one of the main reasons why I really like Passenger 57. Without a doubt this is one of the better Die Hard Clones ever made. It is also is a reminder of a time where Hollywood used to make action flicks like these. I really miss them. 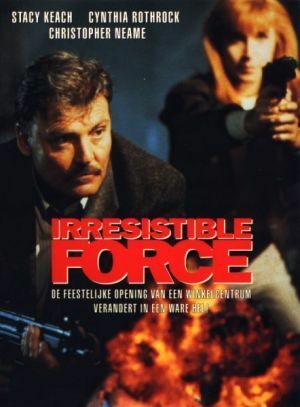 Also read Review Irresistible Force.